Cassie Sobelton debuted her first book, Back to Balance, Crack Your Mind, Body, Spirit Code to Transform Your Health, to share her personal journey to wellness. As a living testament to taking ownership of your life and health, she was excited to share her lessons and knowledge with others who might be struggling with health issues, or just looking to find more balance. Do you feel bogged down by negativity in your life? Are you suffering from disease or illness without a known cause? Have you ever had the suspicion that your physical challenges are trying to teach you something, but you just couldn’t figure out what it was? What if chronic or recurring conditions are actually a higher power’s way of communicating with us, but we just don’t know how to decipher the messages? Though often ignored by Western medicine, the connection between mind, body, and spirit is a strong one. Looking for a Magic Bullet Solution? Have you ever suspected that you could make yourself sick or well based on the power of your thoughts? This is the mind-body-spirit connection in action. You can think of these three aspects like the legs of a table—if any one of the legs is weak, you’re apt to experience poor health. But how do you bring the table back in balance if one of the legs is wobbly? Is it all about nutrition or exercise? Will meditation or yoga act as a cure-all? It’s easy to wish for a magic bullet approach—one thing that will solve all your health problems—but the truth is more complex than that. 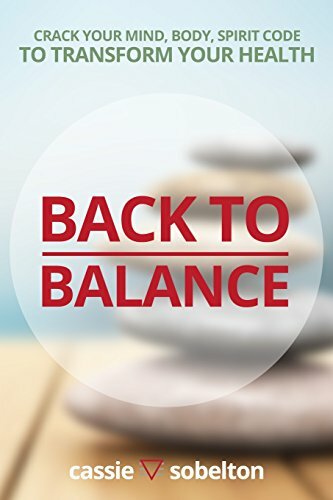 Cassie Sobelton presents a comprehensive health solution in her debut book, Back to Balance: Crack Your Mind, Body, Spirit Code to Transform Your Health. Whereas other approaches tend to focus on one of the three areas, Sobelton advises that all require our attention. Learn how to trust your intuition and recognize signs that you’re on the right (or wrong!) path. Get practical advice for what to eat and how to move your body. If you’re frustrated by a Western approach to health and disease, Back to Balance offers the holistic solution you’ve been searching for. Cassie previews her debut book, Back to Balance, on WXYZ Detroit. THE BODY. Learn about the importance of maintaining balance in the body to your overall wellness. THE MIND. The first element of the Mind, Body, Spirit tripod. We might not realize the power the mind has on how we feel. THE SPIRIT. The final leg of the MBS tripod. How do you find spirit and peace in your life? Cassie Sobelton, Author of Back to Balance and Wellness Expert, shares her book details and how she was able to reverse the symptoms of her Crohn's Disease using holistic lifestyle methods.